Say Hello Again To Our Elderly Friends! 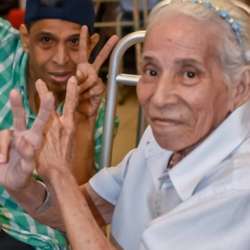 Let's go back to the Hogar de Ancianos San Pedro Nolasco in Chorrillo and share some of our time to get to know better and be part of the history of each of these wonderful people. We will engage them with activities such as playing bingo, stretching and more. If you have games you can bring, or experience with yoga, physical therapy, massage, musical instruments, etc., please post on the event page. NOTE: the exact meeting point will be announced later, and we will arrange to proceed to the location together.